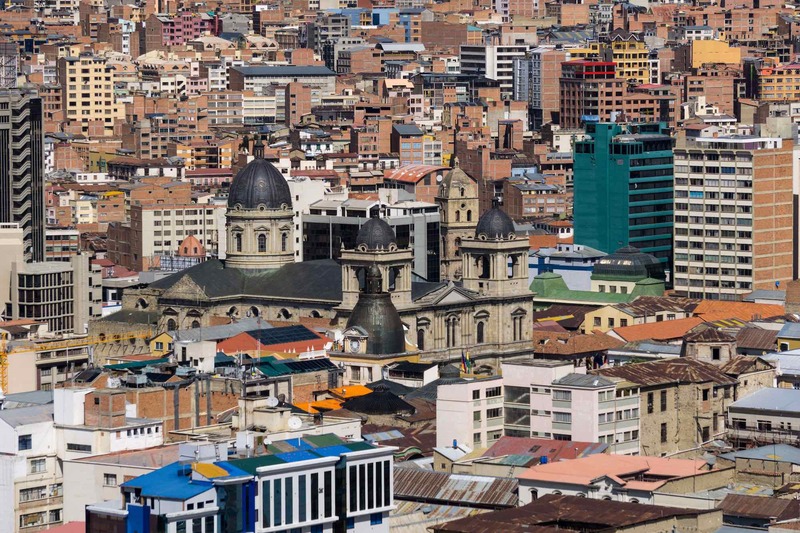 Add one more one incredible place to the list – the city of La Paz. 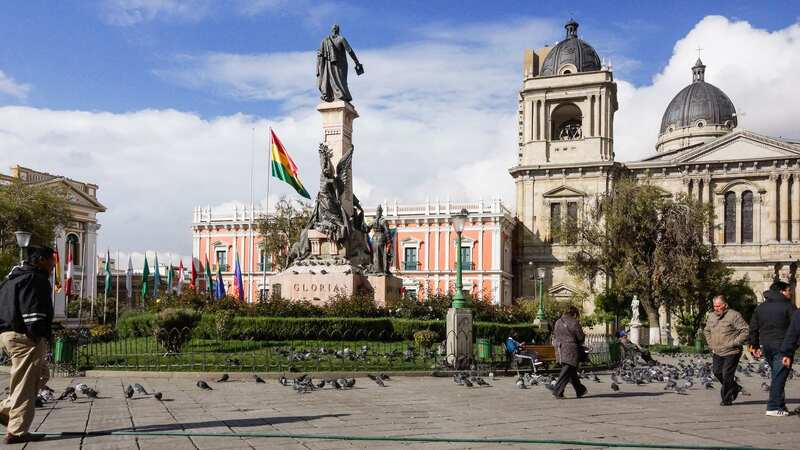 It will be your probable entry point to Bolivia if you are flying in and it may be on your path if you are travelling from Cusco or Santa Cruz. Actually, you will land in El Alto, a sprawling Aymara community some ten kilometers away and 600 vertical meters above La Paz. The satellite image below sets the stage but really does not convey the total “wow” of what you will see. 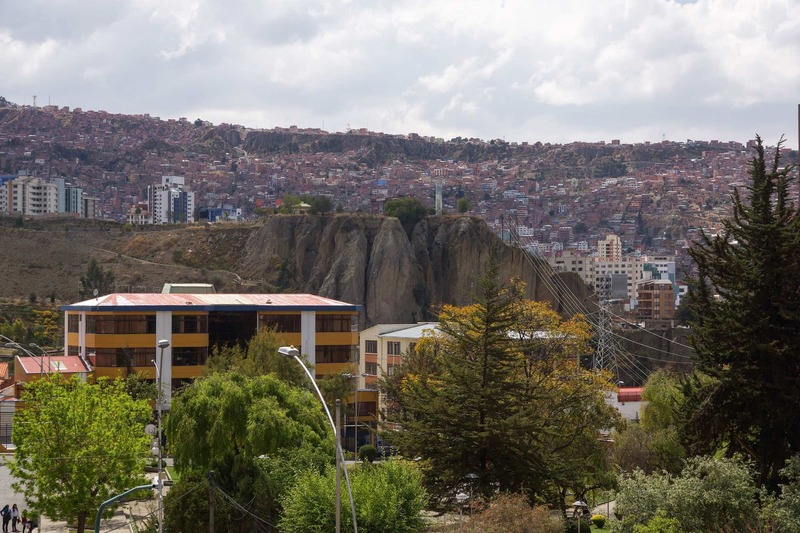 As you leave the airport for your La Paz hotel room you will look down into a gorge cut into the high plains of north-western Bolivia and there it is – La Ciudad de Nuestra Señora de La Paz (The City of Our Lady of Peace)! 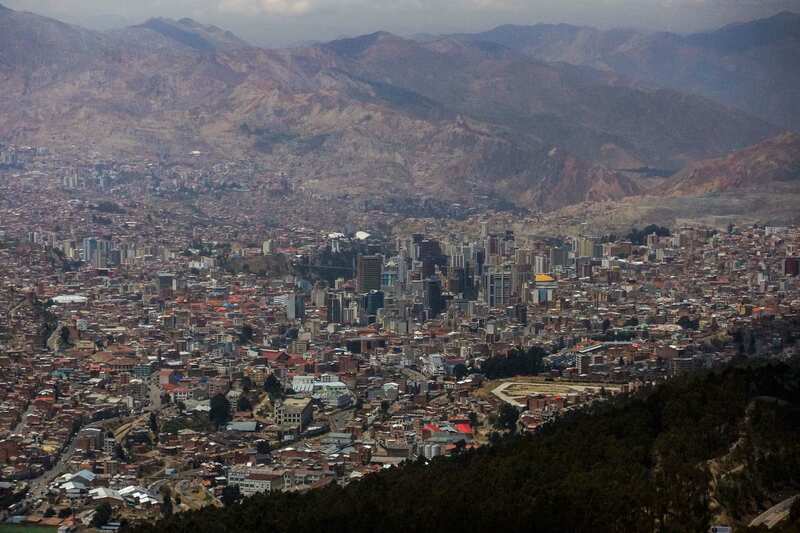 And if the view of the office towers and the homes of a million people built on opposite slopes of the valley doesn’t take your breath away, then the 4000-meter altitude certainly will! Then it is down to the city where for the first couple of days the plan is to take it easy while your body acclimatizes to the higher altitude that it finds itself in. (I came from Toronto at 100 meters above sea level!) 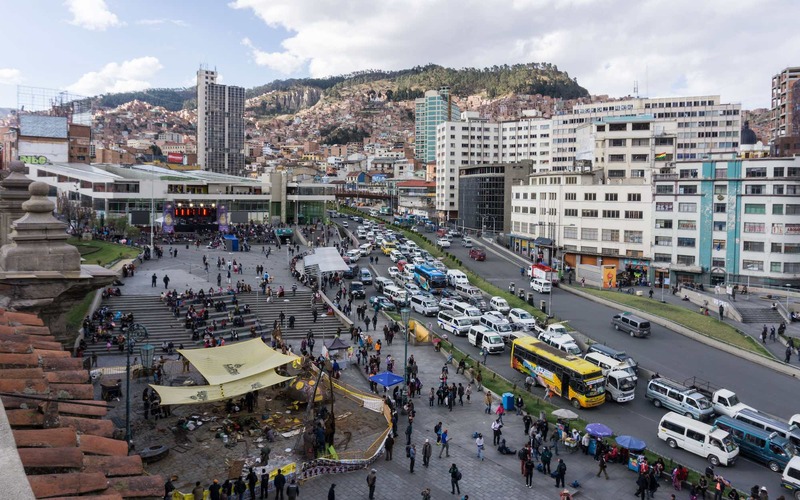 Eventually, you will be feeling up to seeing other nearby sites that make La Paz the base camp for many excellent excursions. (I’ve put those sites in bold in the list above.) 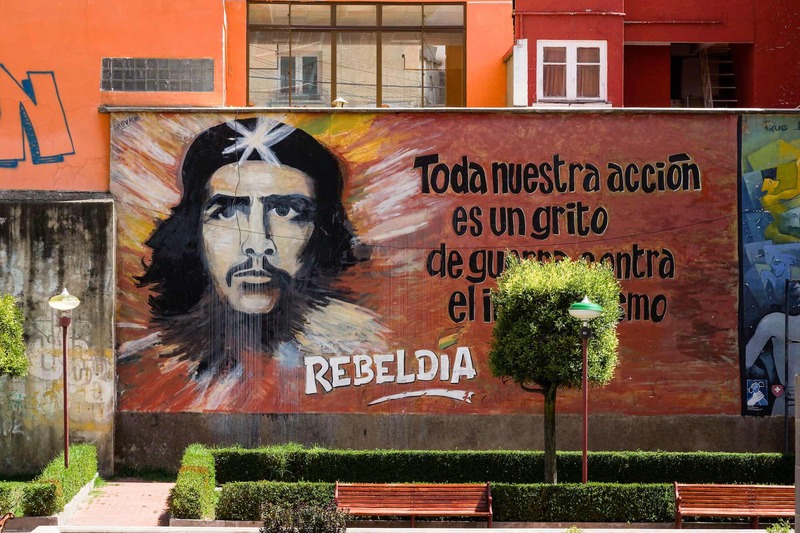 But first, you can explore a dynamic and fascinating city with its unique blend of indigenous and Spanish cultures and its many layers of sometimes tortured history. If you want to get a sense of the city and its people, keep on scrolling! What follows is a list of Things To See And Do that will make sure that your time is not wasted! 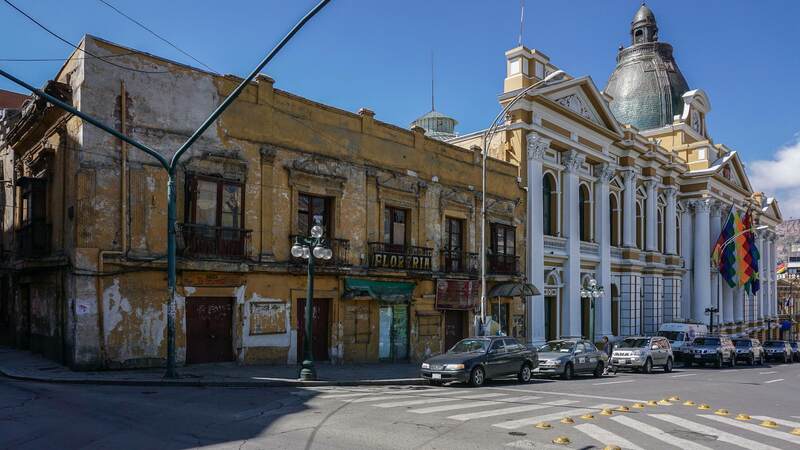 During my one week in La Paz, I stayed at two hotels – The Hotel Rosario on Calle Illampu at the top end of the map and the El Rey Palace Hotel down near the bottom. 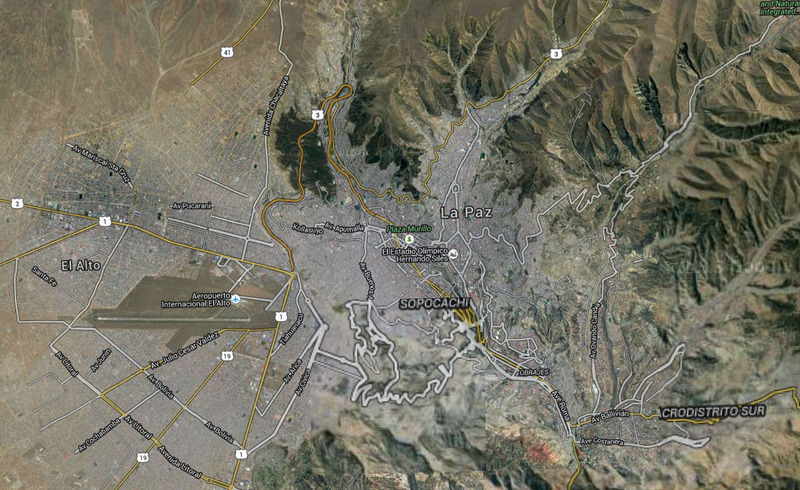 La Paz’s main street is the yellow ribbon that runs down the map. 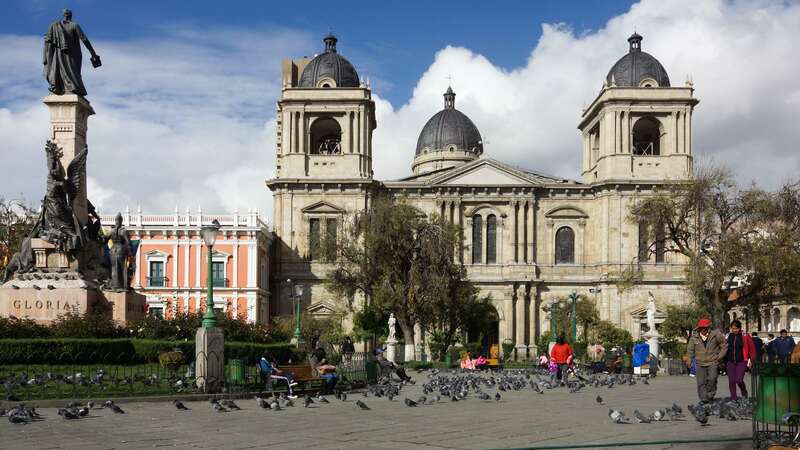 It has different names as you walk south-east from the Plaza in front of San Francisco Church. 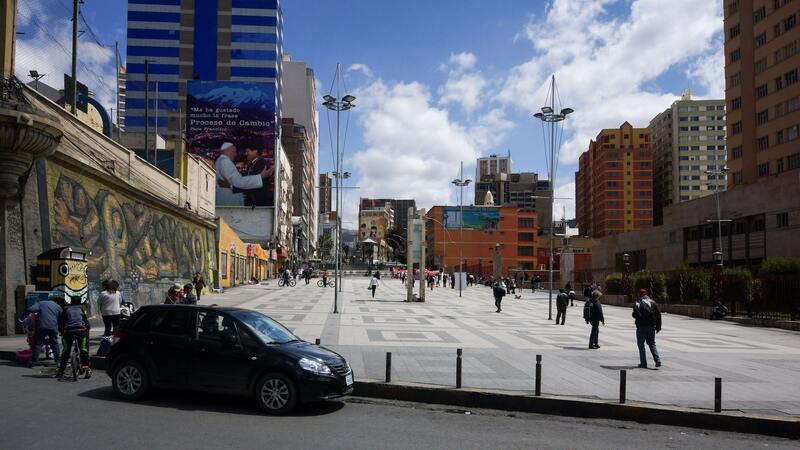 For the first part it is Avenida Mariscal Santa Cruz; then around Calle Colombia, it becomes Avenida 16 de Julio. Locals refer to this stretch, lined with trees, as El Prado. 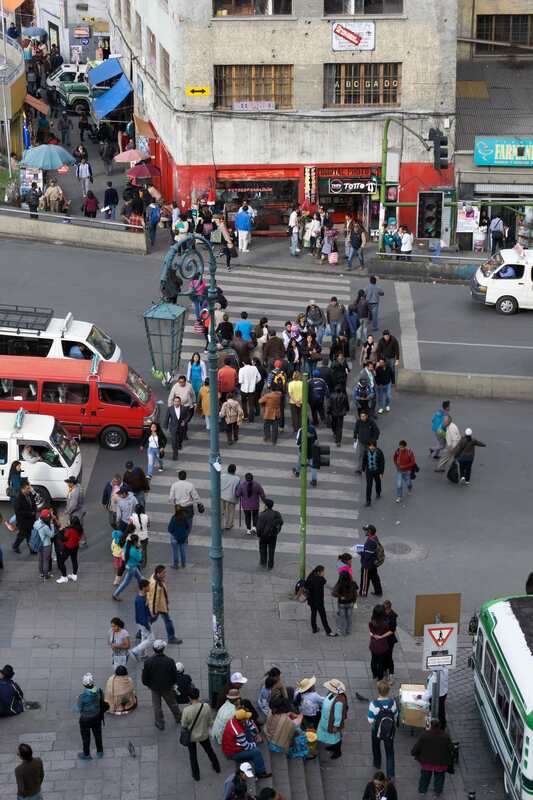 After this stretch it takes on yet another name – Avenida Villazón – before splitting into two streets, the southbound Avenida 6 de Agosto and the northbound Avenida Arca! By this time you are in the neighbourhood known as Sopochachi. Whatever name it is wearing, this 1.5-kilometer walk makes for a great introduction to the city. It also gives you some light exercise as you acclimatize to the altitude. While La Paz does not run with the efficiency of Zurich or Toronto, it is also far from the chaos of Delhi or Calcutta. There are traffic lights which people obey; pedestrians appear to have rights; things are pretty tidy and there is relatively little graffiti; the air is free of the smell of human waste and there are no running sewers on the sides of the street. 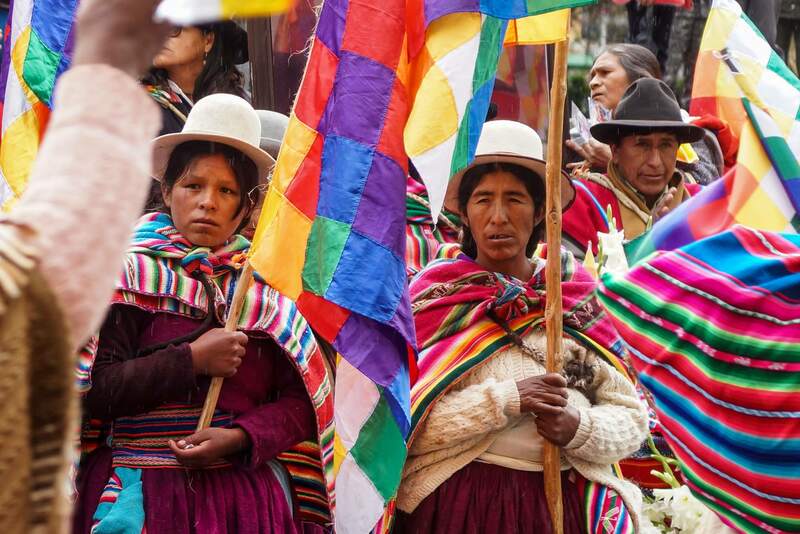 Trying to make something like this work for a million people at 3500 meters (11500 feet) above sea level is a challenge that los Paceños seem to be meeting – and Bolivia is far from South America’s richest country. 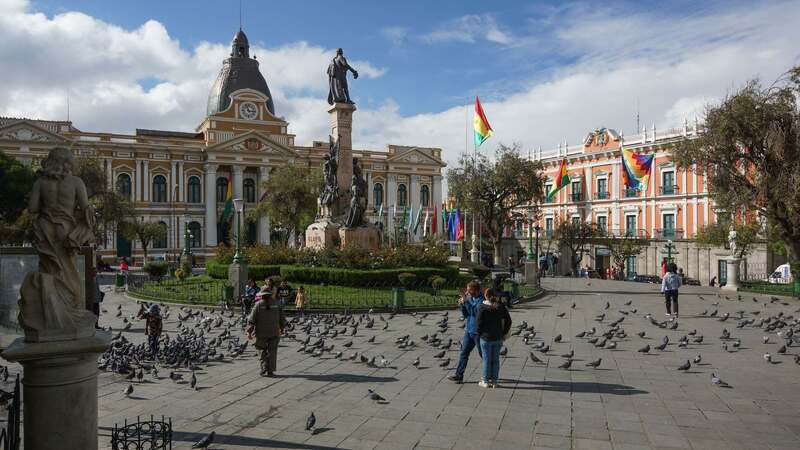 Perhaps I came with low expectations but I must say I was quite impressed with Bolivia’s capital city. Admittedly you won’t find the river that created and apparently still flows down this valley from the Altiplano. Called the Rio Choqueyapu, what is left of the river is buried in concrete beneath the streets and is heavily polluted. 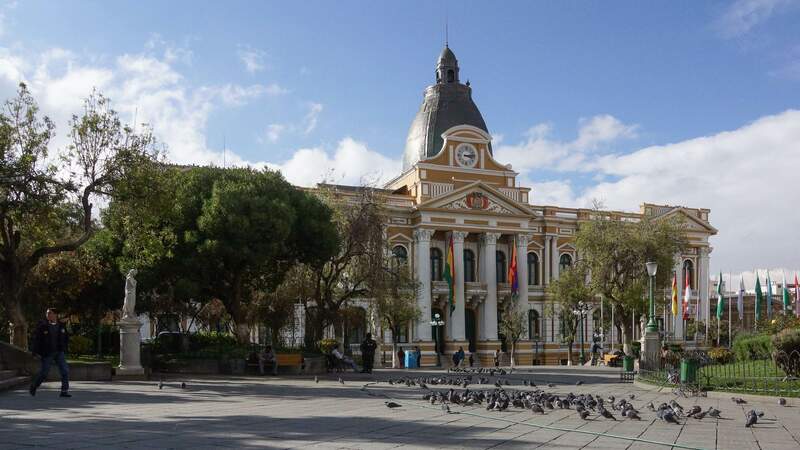 In colonial times, it served as the natural border between the Spanish, who established a commercial and political district on the east side of the river, while the west side was the location of the already-there indigenous community. Echoes of this division can be felt to this day. 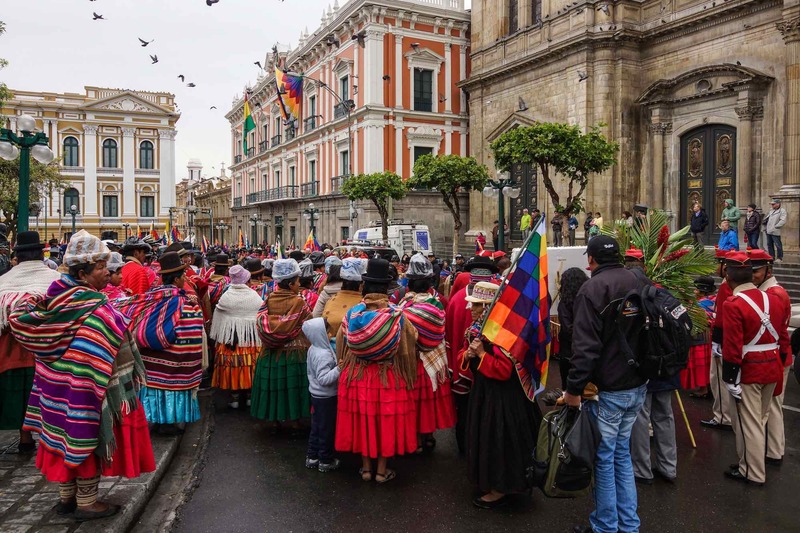 However, a decade of Evo Morales has made for a significant change in the place of the Aymara and Quechua in the cultural landscape of the capital city. I walked down this stretch of the main street more than once during my stay as the variable weather illustrated in the images will show! I was there in September and it rained on three of the 25 days I spent in La Paz and on a trek in the nearby Cordillera Real. As you walk down the street it transitions into a broad avenue with a tree-lined pedestrian walkway down the middle as well as sidewalks on each side of the street. I got to walk it in the rain one day; I returned on a Sunday to find no vehicular traffic at all – it had been turned over completely to walkers! It made for a relaxed and very festive atmosphere. I was especially impressed by the numbers of dogs on leashes. While I did see a few stray dogs in my rambles around the area, most seemed to have owners. 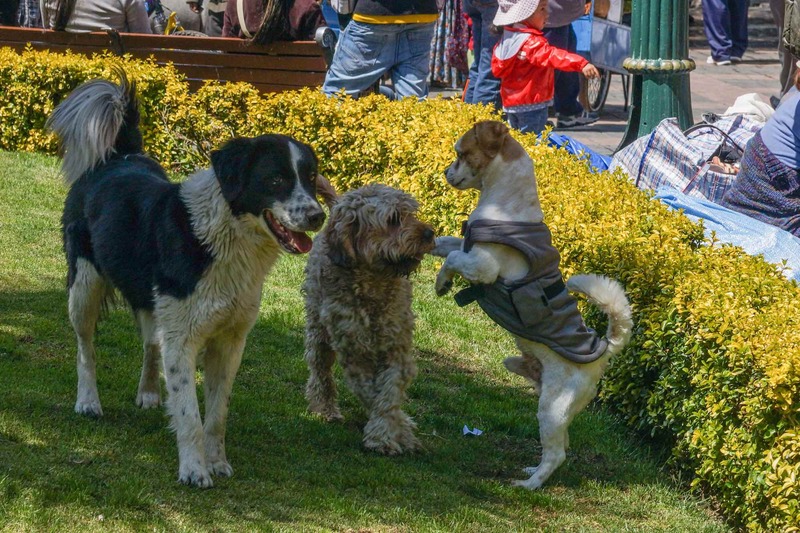 Compared to the packs of stray and often lame and hurting dogs I came across in the towns of southern Patagonia, this looked to be doggie heaven! After I moved down from the Hotel Rosario at the top end of El Prado to the El Rey Palacio Hotel near the Plaza del Estudiante, I got a nice view of the Plaza from my hotel room. In the image below you can see it – the small patch of green – in the middle left. 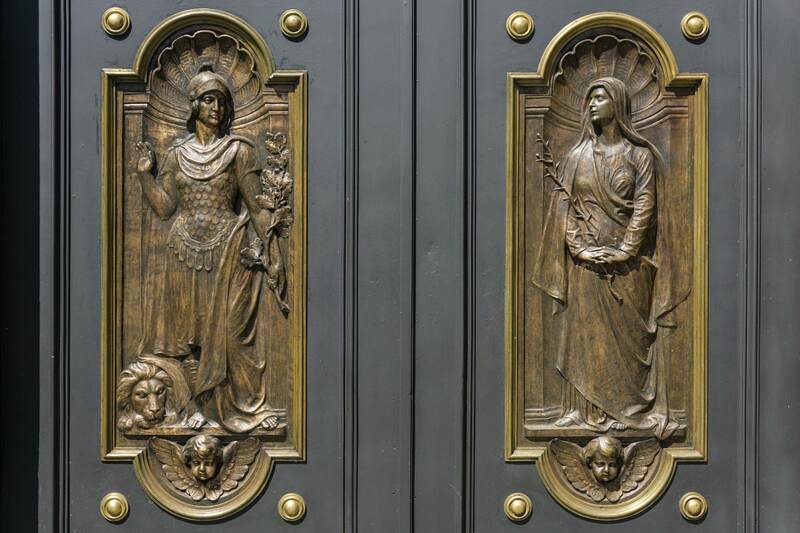 I only ventured a few blocks south of the Plaza on my visit – the pix below show some of what caught my eye. 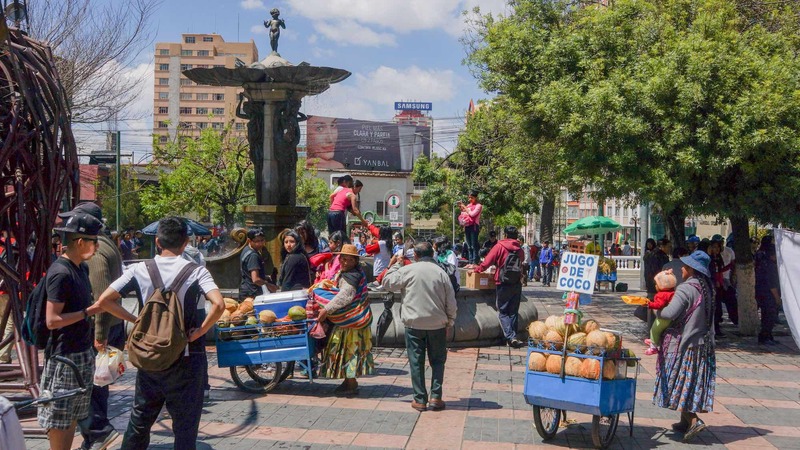 Beyond the neighbourhood called Sopochachi is the upscale district of Zona Sur – a significant 500 meters lower in altitude than uptown La Paz! A bit further down the valley and you get to attractions like the Muela del Diablo and the Valle de la Luna. Maybe next time I’ll get down there! the mural closer up – lots of symbolism for sure! Above is a piece of very dramatic and surrealistic street art. 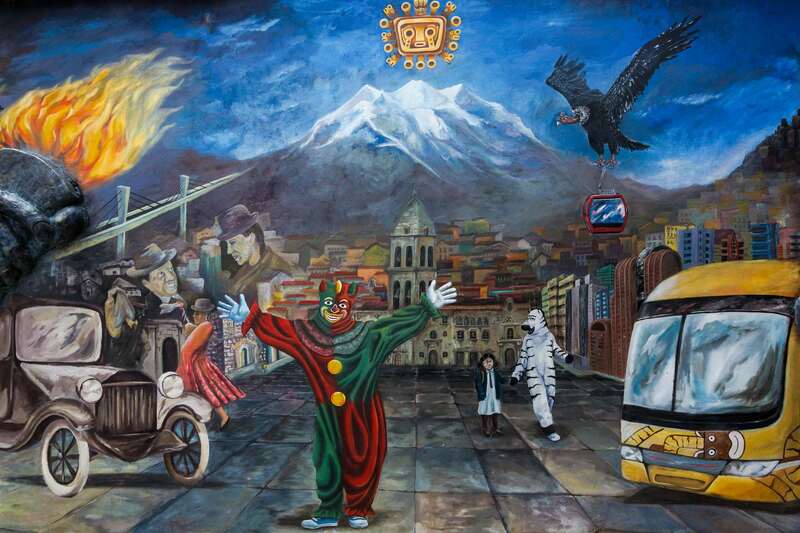 Snow-capped Illimani and the condor with a Mi Teleférico car in his claws and white tigers and a clown who seems quite pleased with the scene – what is going on here? Let me know if you can “read” this image! 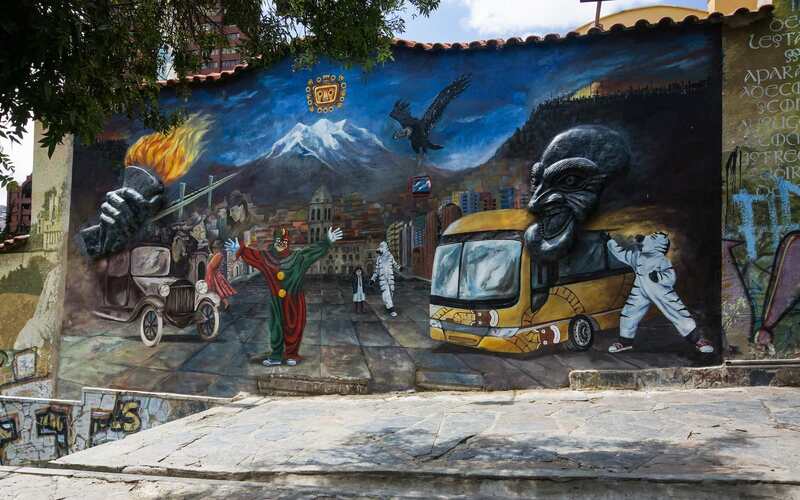 A Reader’s Comment: Two notes about the graffitti: these are not white tigers, are zebras that in the last 15 years helped people to learn about traffic education and became a ‘personaje tipico’ de La Paz. You can experience it being A Zebra for a Day, next time you gotta try, it’s fun! And the ‘clown’ is another typical personaje of La Paz, is called Pepino and is the protagonist of the carnival in La Paz, it has some relation with european harlequin. Toda nuestra acción es un grito de guerra contra el imperialismo y un clamor por la unidad de los pueblos contra el gran enemigo del género humano: los Estados Unidos de Norteamérica. 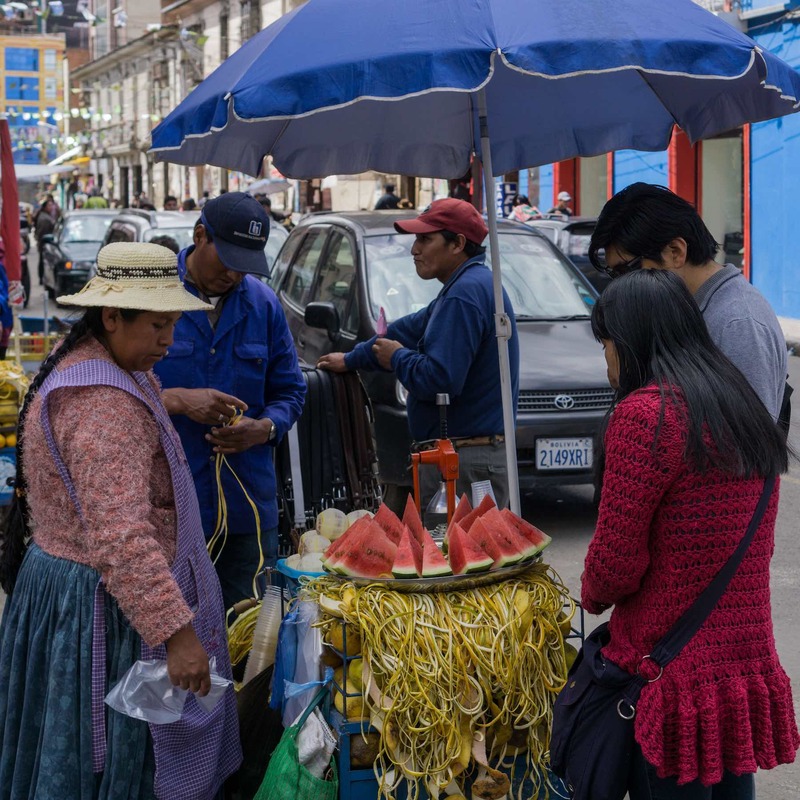 Without a doubt there is much to see as you walk down La Paz’s main street; it makes for a great introduction to this two-mile high city in the Andes. 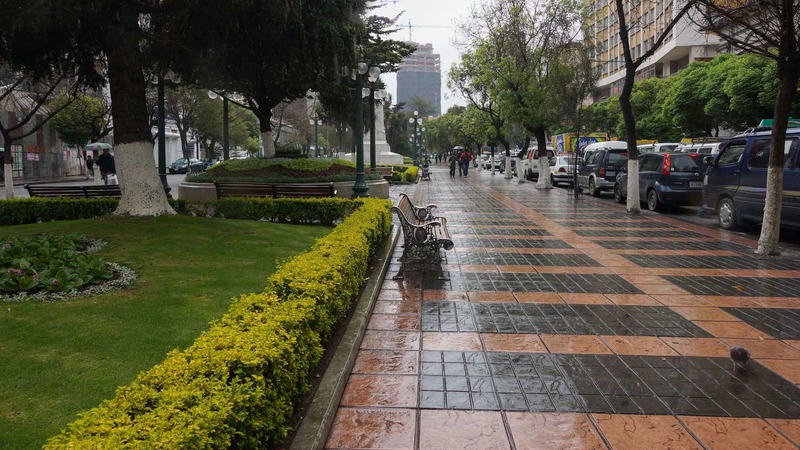 Plaza Murillo is a one hundred meter square set in the old colonial centre of the city. Arranged around the square are the symbols of State and religious power – the National Assembly, the Presidential Palace, and the Cathedral. 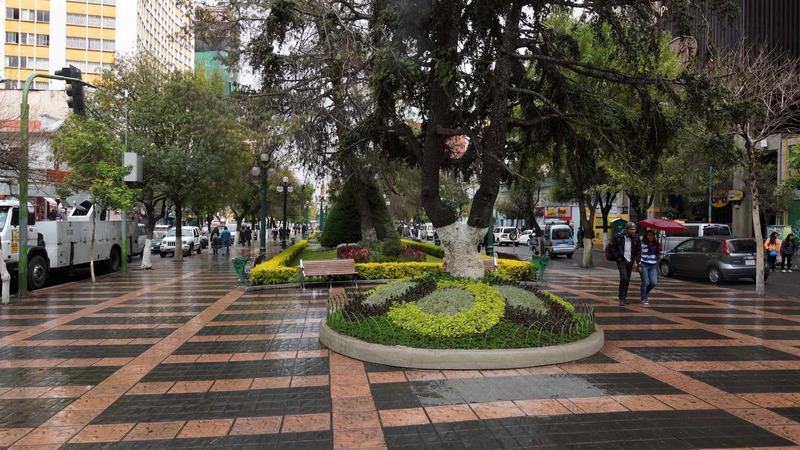 It is a short walk uphill from the Avenida Mariscal de Santa Cruz. 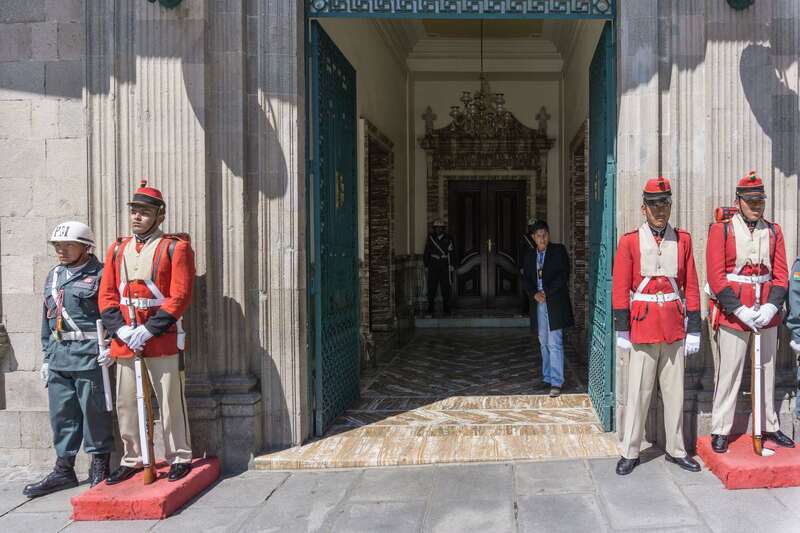 On your way up Calles Socabaya or Ayacucho, you pass by many government buildings and commercial towers housing banks and the head offices of other major enterprises. Also prominent are the high-end hotels frequented by the visiting politicians and business people who have come to make their deals. From afar the square is not even visible. The shot below was taken from the scenic lookout Killi Killi. You can see the domed tops of the Cathedral and of the National Assembly but the green space in front of them is hidden from view. Once you get there, it is a different story! The plaza is alive with locals and visitors from afar. Vendors sell ice cream from under their umbrella-covered carts. Pigeons cover the main terrace while people watch or feed them. 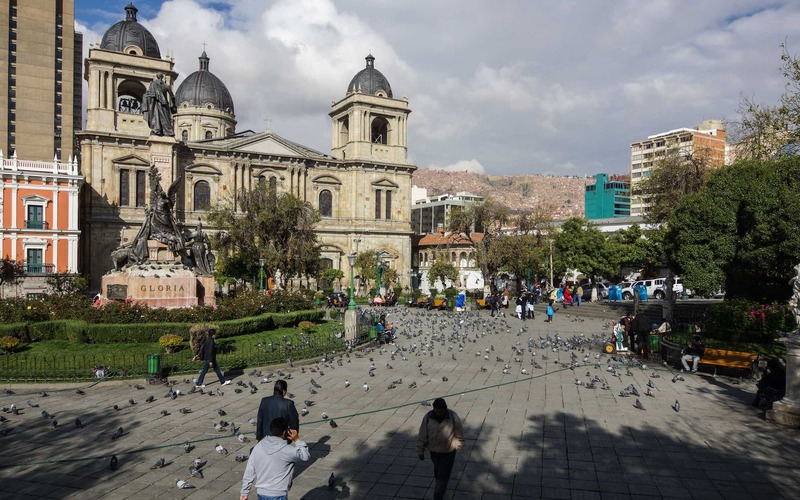 Sitting here for a while and watching la Paz go by is a great way to spend part of a morning or afternoon in La Paz. On on side of the square is the National Assembly (Asamblea Legislativa Plurinacional), the national seat of government. it is done up, as are the other major building around the square, in the neo-classic style that seems to exude stability and power! 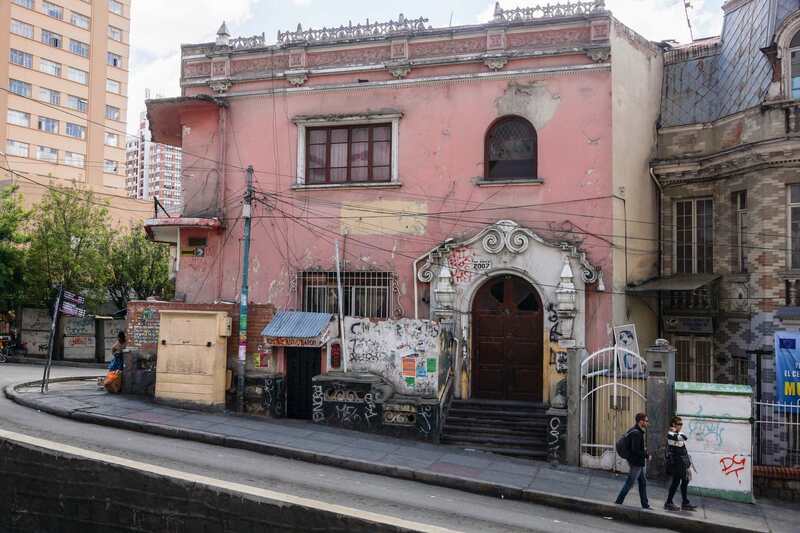 In the photo below it sits to the right of a dilapidated building badly in need of some renovation. 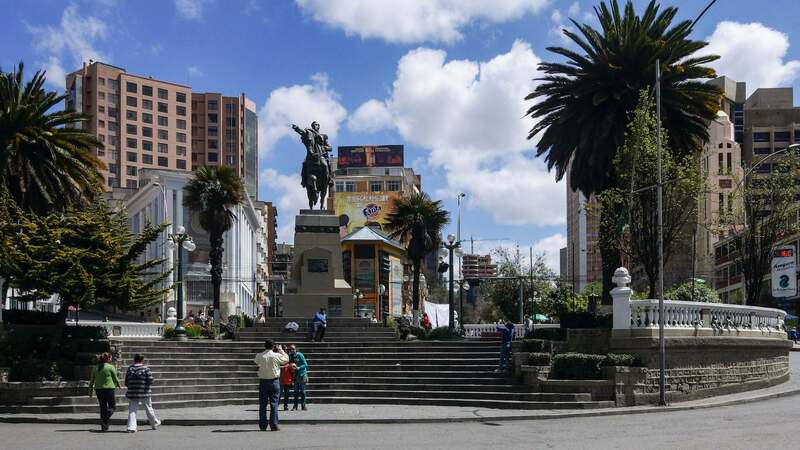 In the centre of the square is a statue of Pedro Domingo Murillo, one of the early fighters for Bolivian independence from Spain. He was hanged in the square in 1810 after the rebellion failed. He is looking toward the Presidential Palace and on his right is the Cathedral. 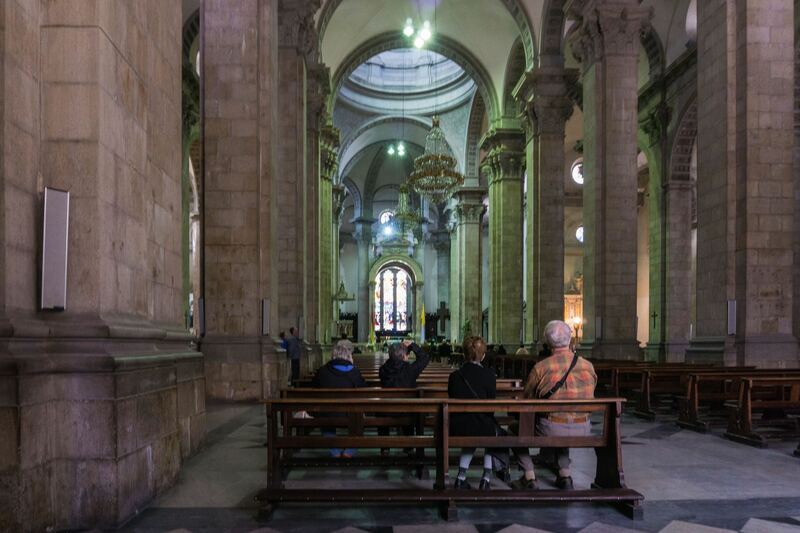 interior shot – La Catedral at Plaza Murillo – austere is the word! 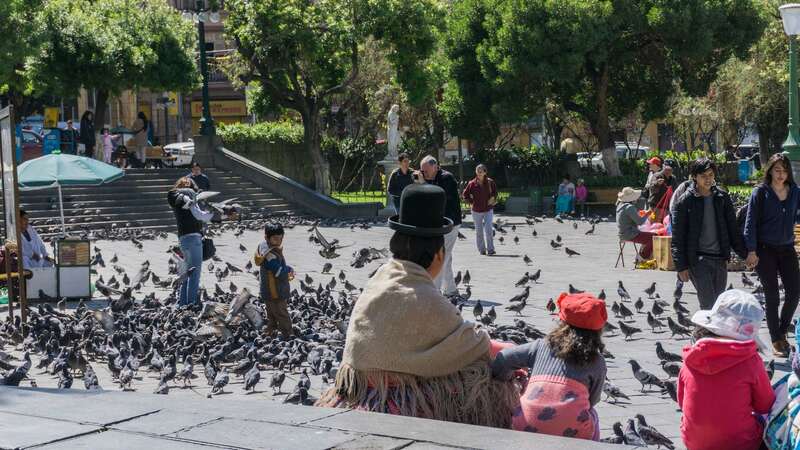 The first time I visited the Plaza Murillo it was a sleepy weekday morning; the sun was out and so were the pigeons and the strollers. I enjoyed it so much I went back a second time on a Saturday. Unknown to me, that morning a major event was being hosted in the square in honour of Bartolina Sisa. 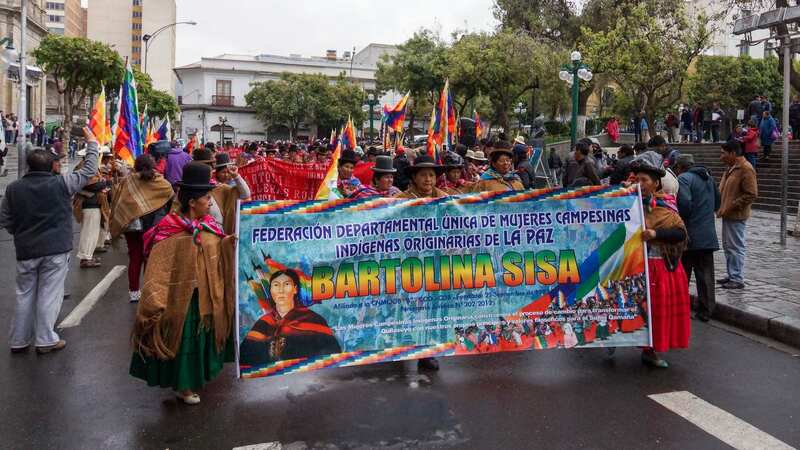 Together with her husband, she led an indigenous uprising against the Spanish in Bolivia at the head of an army of some 40,000 which laid siege to the city of La Paz in 1781. 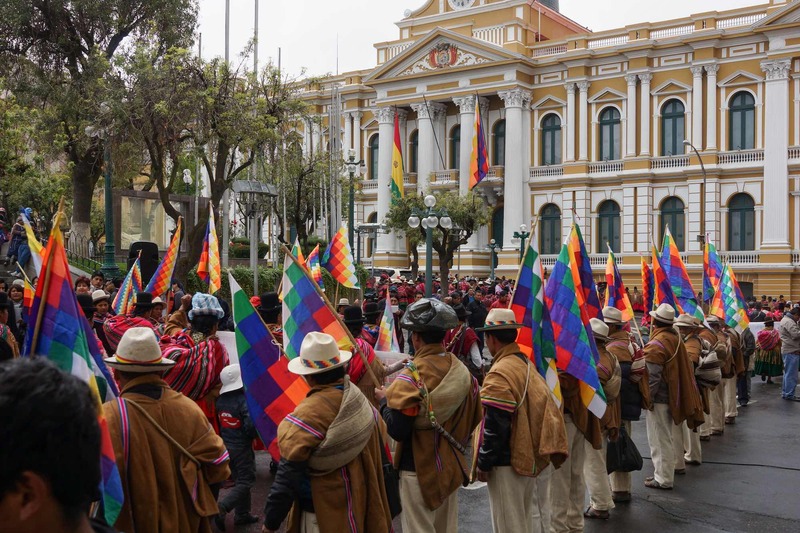 Katari and Sisa set up court in El Alto and their army maintained the siege for 184 days, from March to June and from August to October. Sisa was a commander of the siege, and played the crucial role following Katari’s capture in April. The siege was broken by colonial troops who advanced from Lima andBuenos Aires. Bartolina Sisa was captured and executed by the Spanish on September 5, 1782. She was hanged after being publicly humiliated in the Colonial Square (now Plaza Murillo), beaten and raped. Once dead, the Spanish cut her body into pieces, showed her head in public to intimidate the natives, and sent her limbs to be exhibited in different villages. 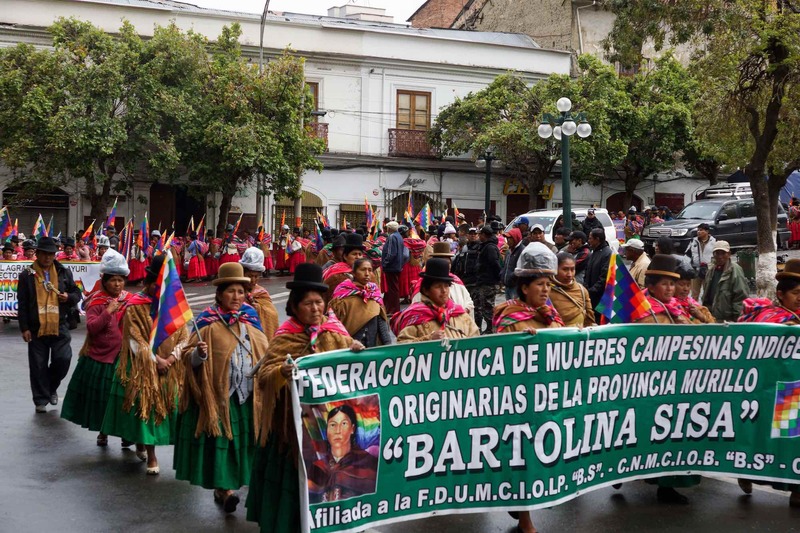 In her honour, the 5th of September was instituted as the International Day of the Indigenous Women since 1983. 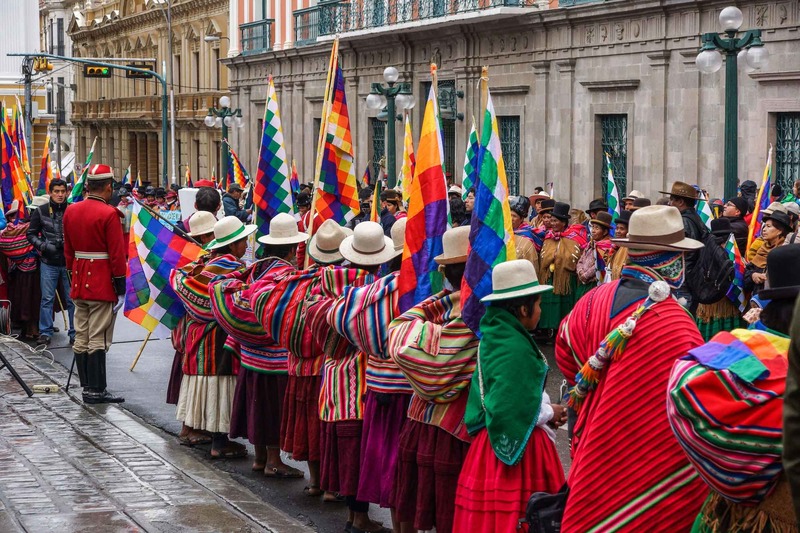 In spite of my ignorance of the details of Sisa’s life and death, I was moved to tears as I stood on the front steps of the Cathedral and watched the commemoration and the parade of delegates from various communities from the Altiplano and the Yungas. 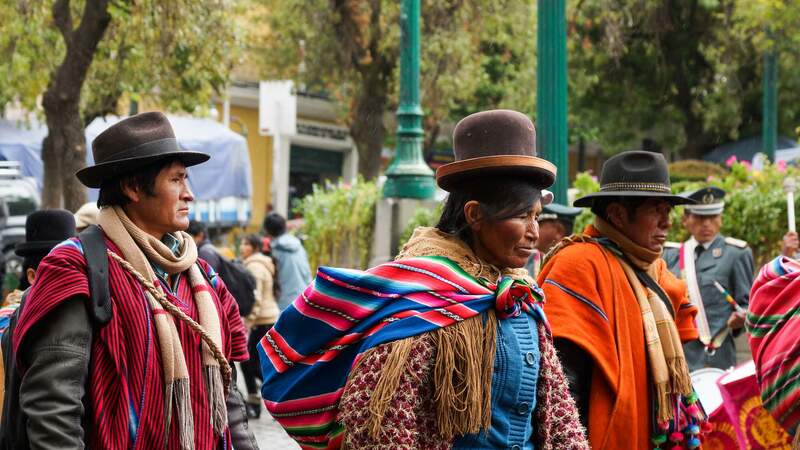 The Aymara and Quechua campesinas there were certainly not members of Bolivia’s privileged class and yet in their faces I read a resilience and a determination. And also a dignity and a pride in who they were and of those who had come before them. 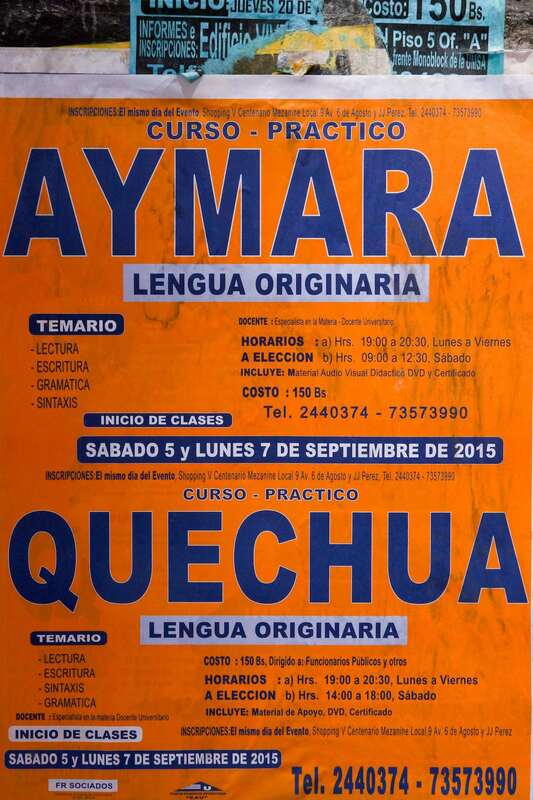 Prominently displayed was the Aymara flag, the Wiphala. 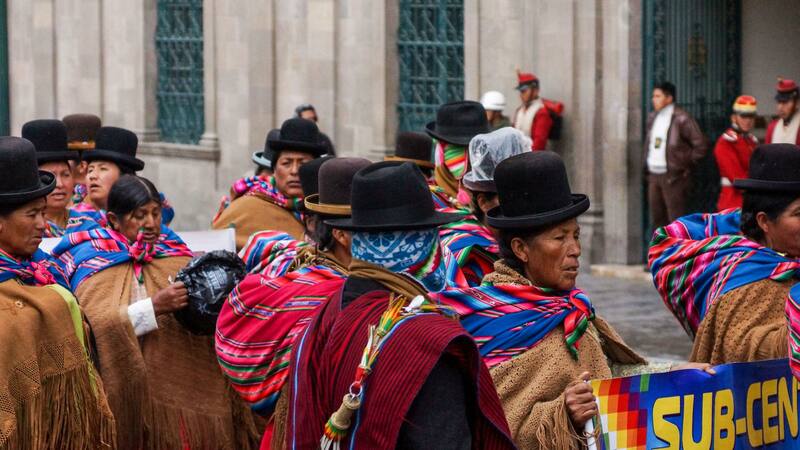 One significant change thanks to Evo Morales is the greater recognition of the place of Bolivia’s indigenous people. I was half-expecting him to come walking out of the Palace down the corridor pictured above to join the crowd in the Plaza Murillo! 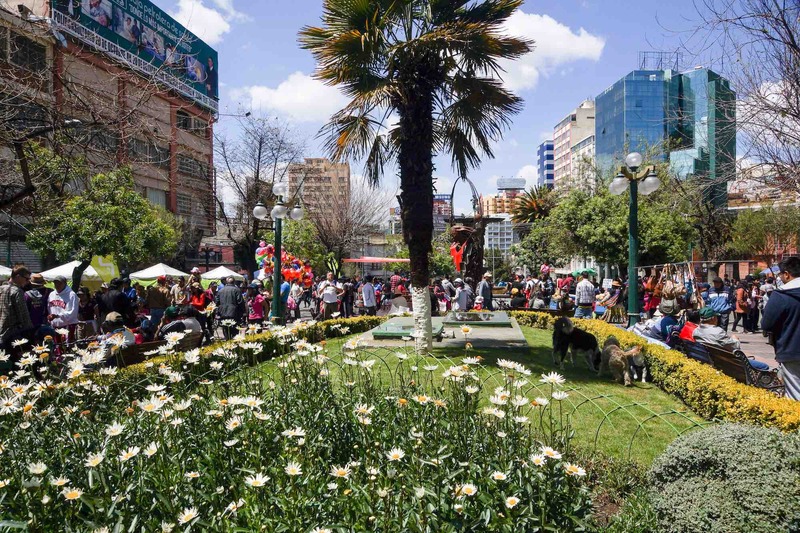 Plaza Murillo comes to life! 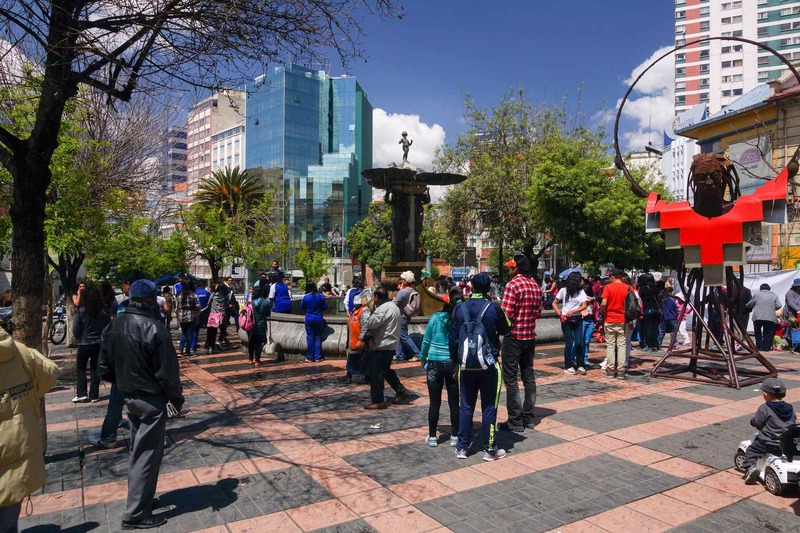 You may not get to be there for the same event I did on my second visit to the Plaza Murillo, but you can be sure to leave with your own positive memories. It is definitely worth an hour of your time. 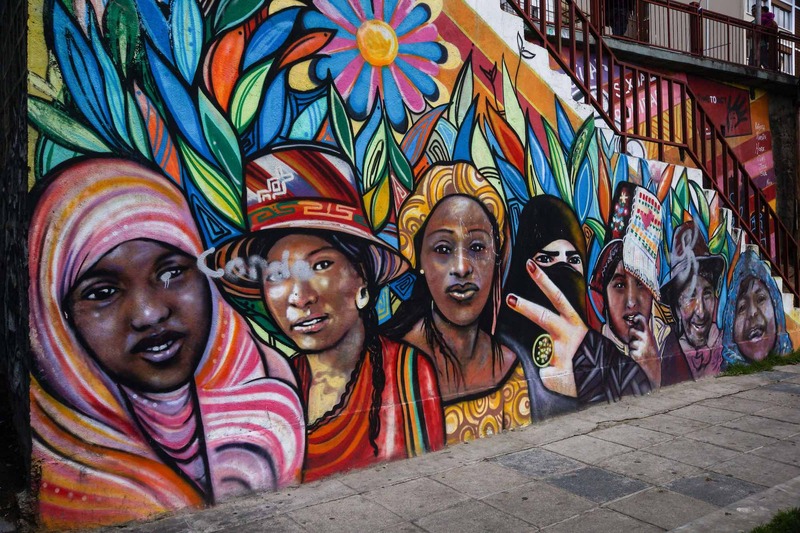 Two notes about the graffitti: these are not white tigers, are zebras that in the last 15 years helped people to learn about traffic education and became a ‘personaje tipico’ de La Paz. You can experience it being A Zebra for a Day, next time you gotta try, it’s fun! And the ‘clown’ is another typical personaje of La Paz, is called Pepino and is the protagonist of the carnival in La Paz, it has some relation with european harlequin. I’m glad you enjoyed your stay in La Paz. David. You make a great case for hiring a local guide to point out things that a tourist just would not know about. Thanks for taking the time to explain the characters in the mural to me. It makes me appreciate it even more.